2 18.1 (P.164) I know the boy . WHO is wearing a leather jacket. 3 The novel is very interesting. 4 The boy whom we met just now is Susan’s brother. 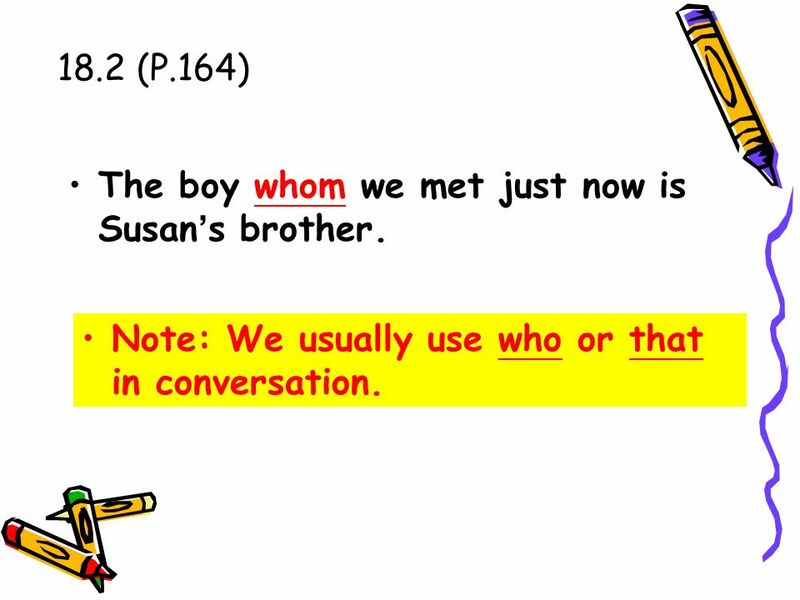 18.2 (P.164) The boy whom we met just now is Susan’s brother. Who? Whom? 6 18.2 (P.164) The boy whom we met just now is Susan’s brother. Note: We usually use who or that in conversation. The boy whom we met just now is Susan’s brother. Note: As the object of the verb in the clause, the relative pronoun can be omitted. 8 Exercise 1 The experiments that she is currently working on are some of the most important in the University. The experiments that she is currently working on …… object? Subject? 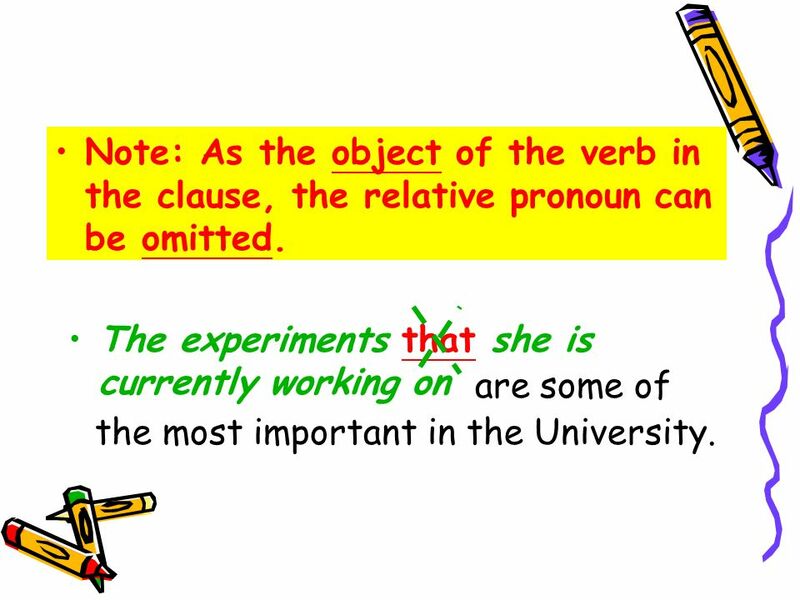 9 Note: As the object of the verb in the clause, the relative pronoun can be omitted. The experiments that she is currently working on are some of the most important in the University. 10 Did you see the book that was on this table this morning? 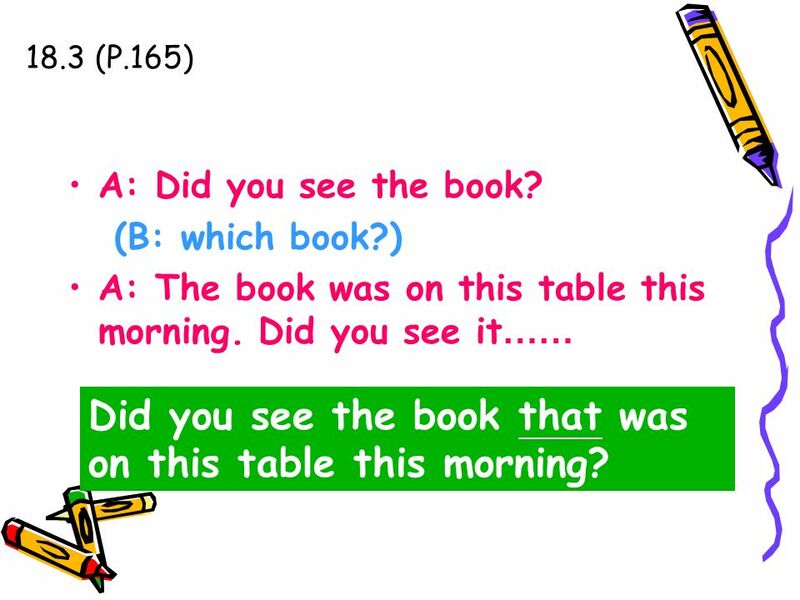 18.3 (P.165) A: Did you see the book? (B: which book?) A: The book was on this table this morning. Did you see it…… Did you see the book that was on this table this morning? 11 Is this the book that you bought last week? 18.3 (P.165) A: Is this the book? (B: which book?) A: You bought the book last week. Is this the book…… Is this the book that you bought last week? 12 Do you remember the day when did we first meet? 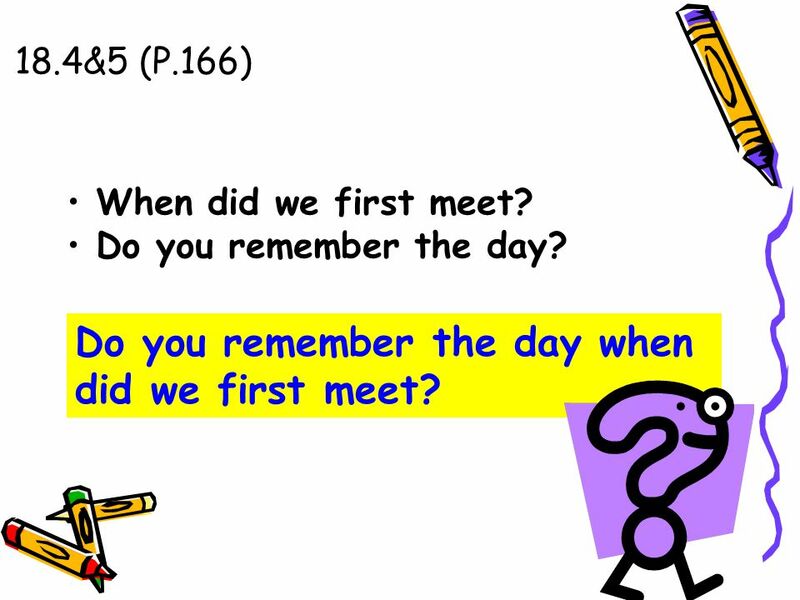 18.4&5 (P.166) When did we first meet? Do you remember the day? Do you remember the day when did we first meet? 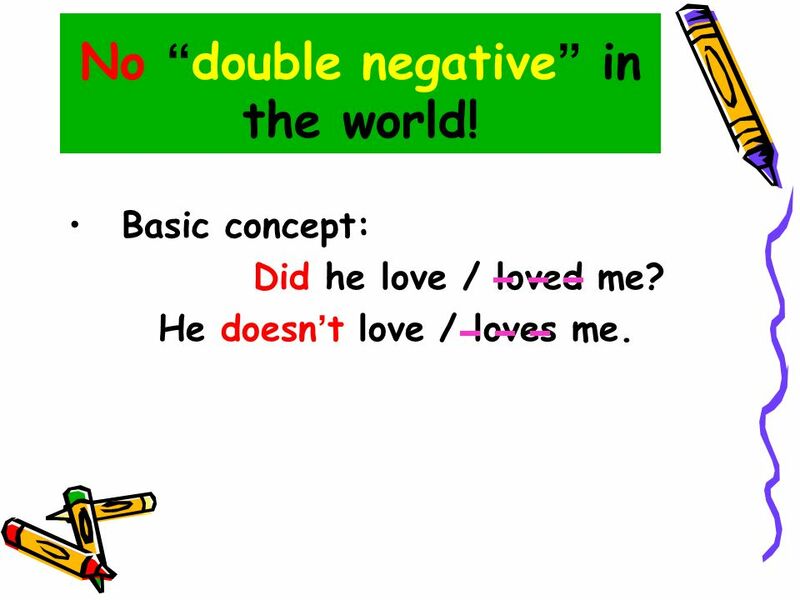 13 No “double negative” in the world! Basic concept: Did he love / loved me? He doesn’t love / loves me. 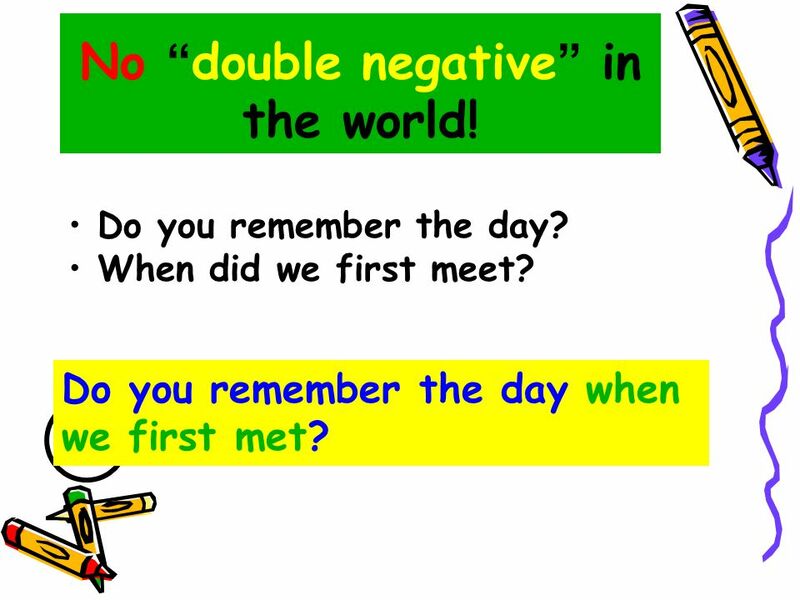 14 No “double negative” in the world! Do you remember the day? When did we first meet? Do you remember the day when we first met? Do you remember the day when did we first meet? Do you remember the day when did we first meet? 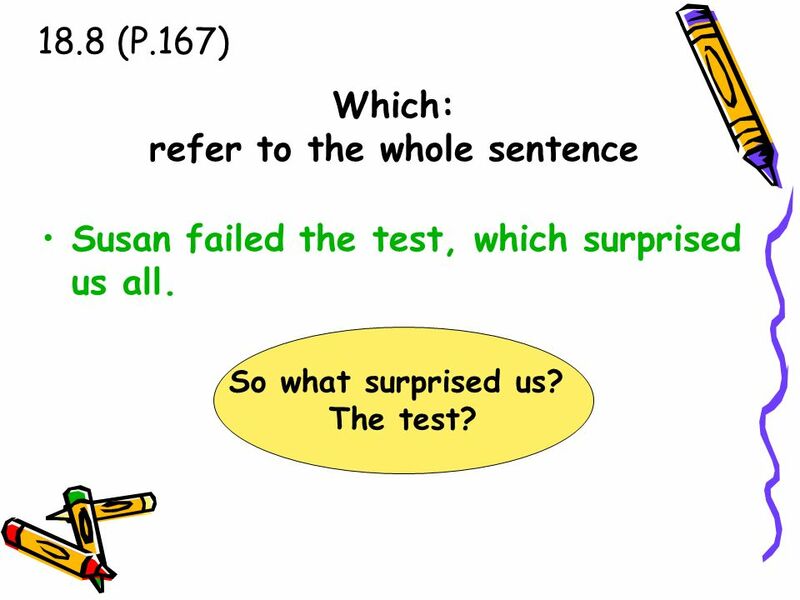 18.8 (P.167) Which: refer to the whole sentence Susan failed the test, which surprised us all. So what surprised us? The test? 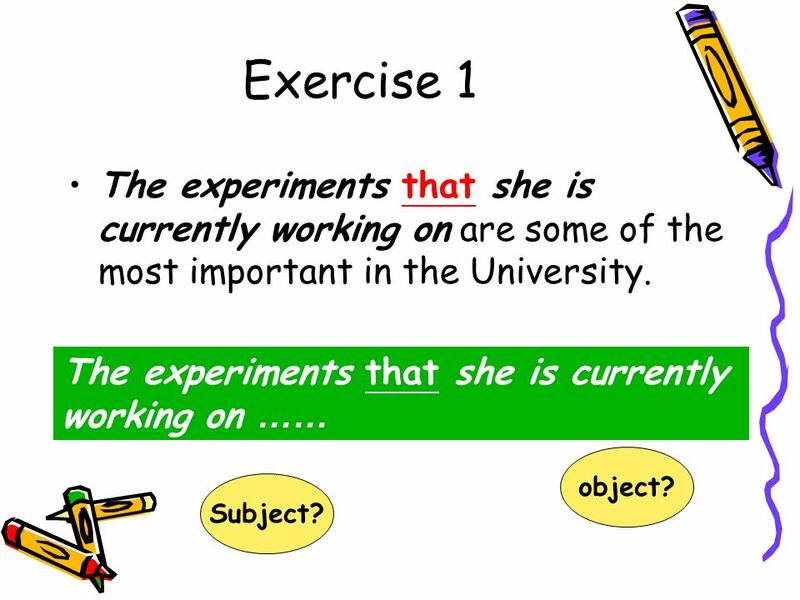 Download ppt "Relative clause Unit 18." 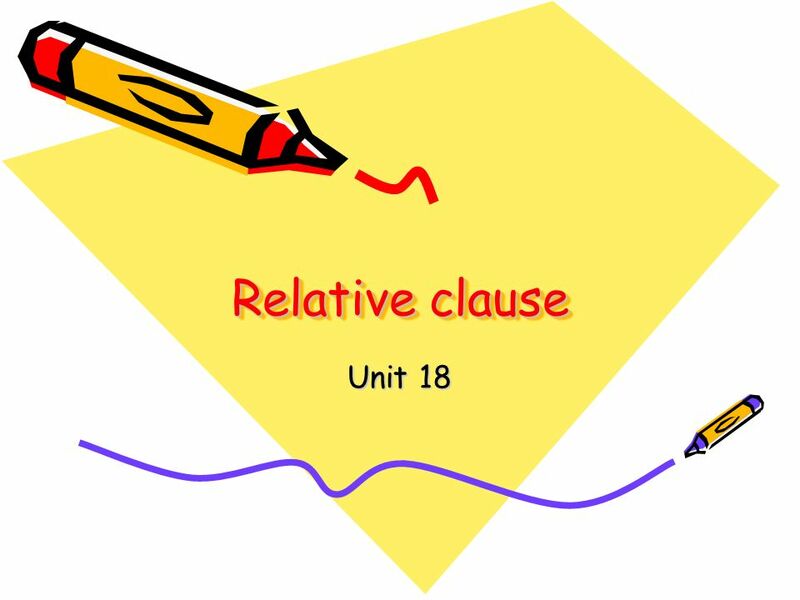 Group 2 GVD Class 4 : Relative Clauses Mark Holloway. RELATIVE SENTENCES © BENI SUAREZ PRADO RELATIVE SENTENCES FUNCTION AS ADJECTIVES THERE ARE TWO TYPES DEFINING NON- DEFINING. UNIT 5 ReLative Clauses. Defining relative clauses essential information. EX: The woman who showed the most determination got the job. 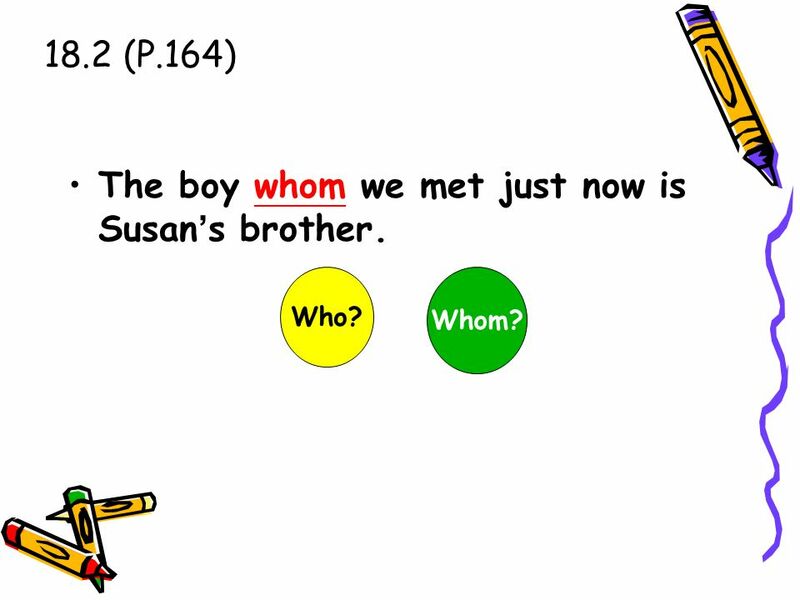 Relative pronouns and relative clauses. 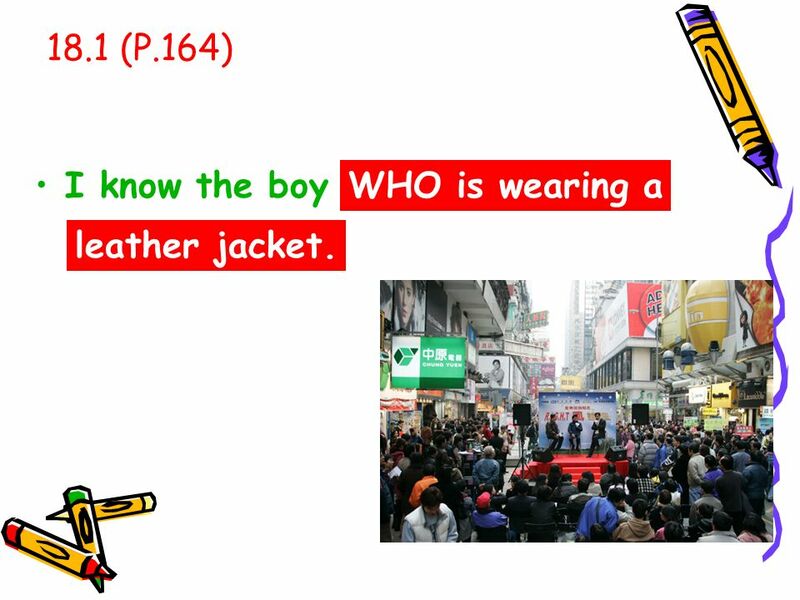 A relative clause gives information about a noun. It immediately follows the noun it describes and often begins. Past Verb To Be Prof. Lorena Sáez. Prof. Lorena Sáez. Prepared by Jason Wong Defining and Non-defining Relative Clause. Subject / Verb / Agreement. It means A singular Subject takes a singular Verb. Welcome to a presentation on.  Defining relative clauses define or identify which person or thing you are talking about: ◦ The man who came in late is. BASIC LEVEL 2. 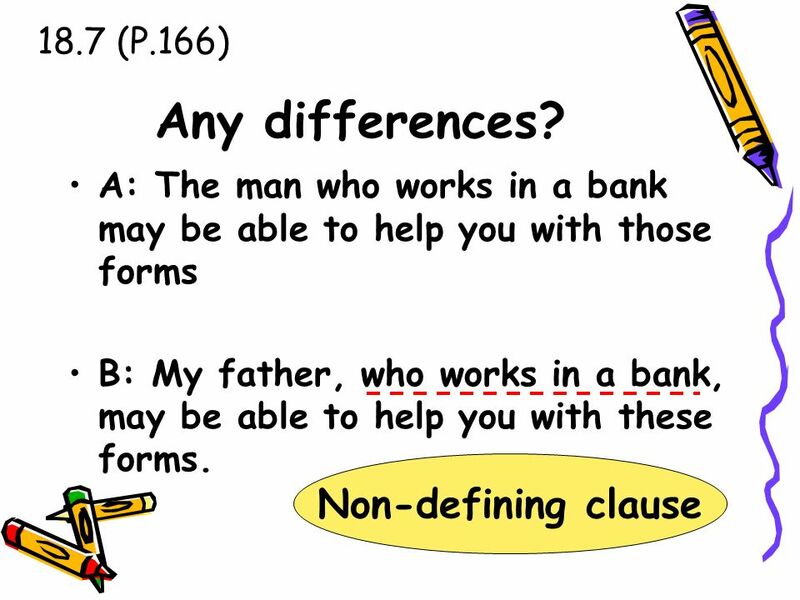  Relative clauses are subordinate clauses. 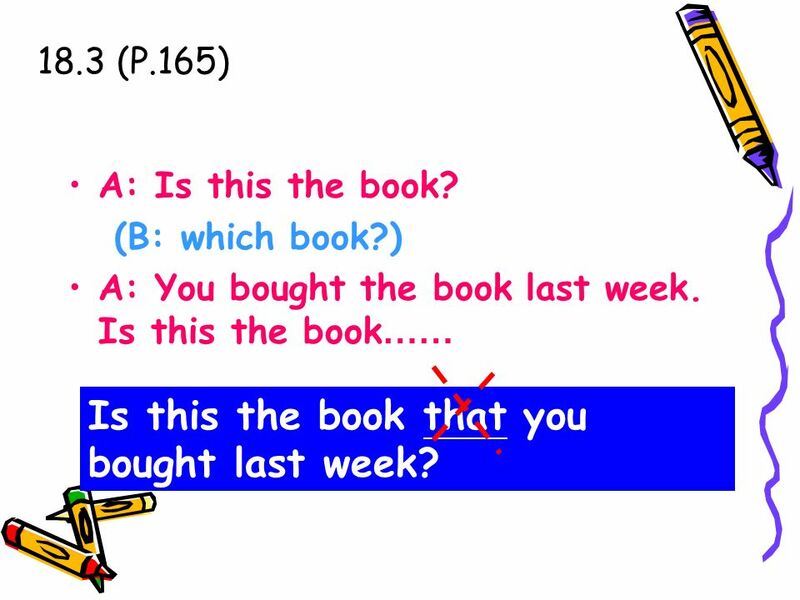  Relative clauses function as adjectives: The blue jacket The jacket which is blue  But the. RELATIVE CLAUSES. 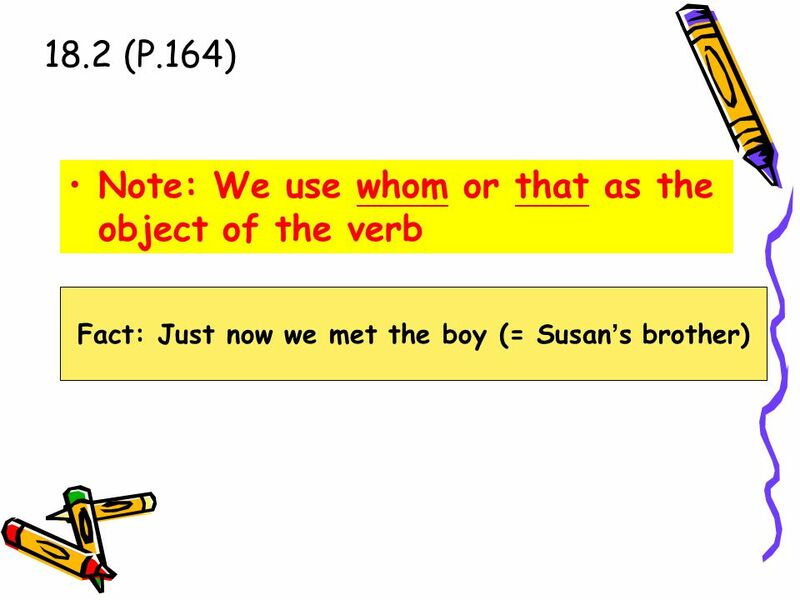 The relative pronoun: A relative clause is used to form one sentence from two separate sentence. Who → is used for person as a subject. Technology in language teaching Instructor : Mr. Nguyen Ngoc Vu, Ph.D. 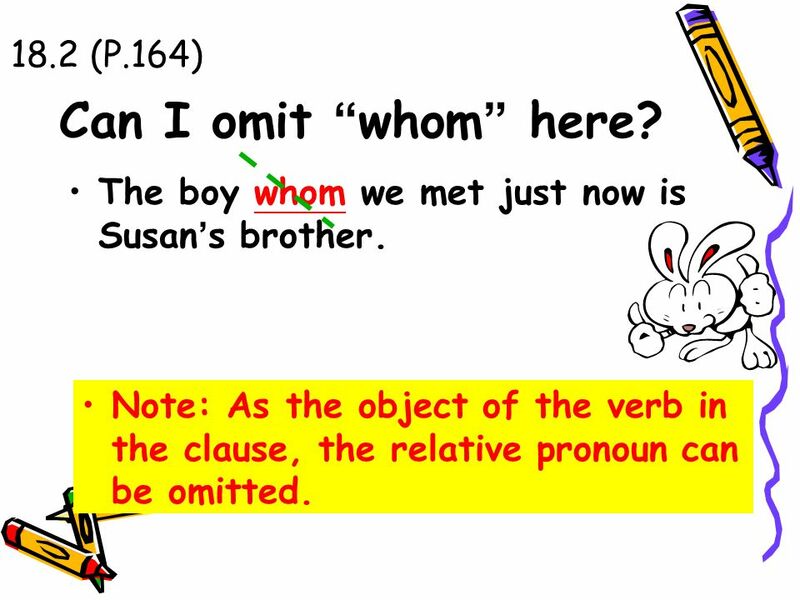 REDUCED RELATIVE CLAUSE Created by: Nguyễn Thị Thanh Mai Nguyễn Thị Quỳnh Trâm. © Rafael Moreno Esteban Relative nouns and Relative clauses EOI El Puerto 2º CAL Inglés. Adjective Clauses who whom which that whose when where LAY SENGHOR1. Relative Pronoun.  Hello, I’m Sara. Do you want to know my family?